A charity that helps people affected by road deaths has been given a helping hand by two local businesses. The Road Victims Trust, which provides free emotional and practical support to those affected by fatal road collisions in the region, has offices in Kempston and Hitchin. 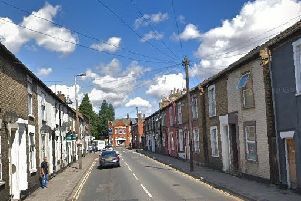 The head office is in Kempston and the base in Hitchin is used by co-ordinators and counselling volunteers to provide support to families, individuals and witnesses, after losing their loved ones on the road. The Road Victims Trust’s garden was in need of a little TLC, and two businesses were approached to see if they could lend a helping hand to give it a makeover. Tom Williams, managing director and founder of Maydencroft in St Ippolyts, near Hitchin, was approached to see if he could help the trust. Tom said “he would be delighted to help” and sent two of his employees to do the job - Patryk Zielinski and James Gough. A spokeswoman for the trust said: “The timber was very kindly donated by Paul Holman, manager of Travis Perkins in Bedford, so that the job in hand could be carried and we were very grateful for this.